Exploring the Cetacean-Human Relationship - Orcas train annual pass carrying SeaWorld regulars to be anti-cap! The authors of this site do not advocate Petting Pools. Please see our article for more details about our thoughts on the subject of keeping cetaceans captive, and the ethics of petting pools. Thirty years before “Blackfish", about the time Tilikum was born, newly captured orcas were reaching out to the humans around them, inviting the humans into their social lives, to become their friends as equal intelligent beings. Some of these orcas are still alive and are seen in “Blackfish". Others died in their youth. Two groups of humans, perhaps driven by the same fascination, spent many hours with these orcas, in physical contact. The first group were the trainers and staff of SeaWorld. Regardless of their personal inclinations, these humans were required by their employment to treat the orcas as mere animals, as possessions, as livestock to be controlled and manipulated within small pens. The tragic events of “Blackfish” inevitably unfolded upon a succeeding generation of trainers. The second group of humans were park visitors who, through a fortunate (for the orcas) series of circumstances, were allowed unrestricted access and interaction with them giving these visitors a glimpse into the true nature of orcas. The time the orcas spent with these humans was a break from training and performing. These humans relieved their boredom, gave them focused attention, and lavished affection on them. By the time of “Blackfish” this brief period in the orcas’ lives and these humans had become an almost forgotten footnote of history. Join us in this website to learn some of that history and what an orca is like as a social equal. 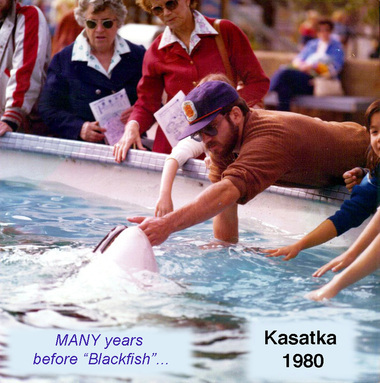 In the late 1970’s and early 1980’s SeaWorld San Diego rotated recently captured orcas through its dolphin petting pool. Tens of thousands of untrained park visitors were able to interact with orcas, practically unsupervised. Orcas and humans were free to explore each other’s natures without the agendas of training or performances. The orcas became friends with a dozen or more repeat visitors. This website explores actual experiences of human-orca friendships. We do this to help orcas and other cetaceans, both to promote the responsible release of those in captivity and to improve how orcas are regarded in the wild. By publishing this little known glimpse of human-orca relationships, we hope to expand people's comprehension of orca intelligence and their social and emotional complexity. Orcas may be very different from people, yet their nature is such that humans should hold that orcas count as individuals and not just as a species. It is not OK to harm individuals for the good of the species by putting them on display for people's education or by managing them as one would salmon stocks. In the wild, orcas benignly ignore humans, and humans are restricted by various nations' laws from approaching them. It has been observed since early days of capturing orcas, that soon after capture orcas undergo a radical change and begin trying to socialize with humans. Trainers form a relationship with "their" orcas but with agendas based on a commercial purpose. It is not a relationship that is free to develop according to the orcas' true nature. There is very little information on orca behavior and the social relationships they form with people when free from agendas. L98 Luna attempted to form such relationships, but the humans were under constraint of Canadian law not to. Our personal experiences and those of the other orca-friends could significantly expand the available scientific data on this subject. Under United States law capture is no longer legal*, and encountering sociable orcas in the wild is both illegal under the Marine Mammal Protection Act and, in the case of the Southern Resident orcas of the Pacific Northwest, also under the Endangered Species Act, and does not occur in any case. This insight into orca behavior is not likely to recur. Although "Blackfish" mentions that the orcas were once friendly, it overwhelming presents orcas after they had been subjected to years of emotional degradation and the stresses of captivity. This is not at all their true nature. If your primary knowledge of humans were a documentary that mostly showed the inmates of an insane asylum or a cruel prison camp, what impression would you have of humans? In a sense, our situation is like that of the former trainers, who reconsidering their actions as employees, have come forward to tell their stories. We were once repeat visitors, but we are against keeping cetaceans in ca﻿ptivity. Our primary difference from the former trainers is that the relationships we formed with the orcas were strictly based on mutual curiosity, friendship, and play. We are appealing to the orcas’ additional once-friends to join us and add your experiences to these pages. We welcome ex-staff who worked directly with these orcas or have knowledge of the history of the petting pool days to add your experiences as well. Park visitors' remembrances, ﻿Park visiphotos and videos from this era are welcome **. We also include experiences with the dolphins and pilot whales who shared the pool with the orcas. Not only are they very intelligent in their own right, but they interacted with the orcas and provided an interesting contrast to the orcas. If you are interested in learning an almost unknown facet of orca behavior please read our individual experiences under the "Encounters" tab. We also invite visitors to read our “Captivity Ethics” page for a deeper look at our rationale against cetacean captivity. * De facto illegal, since no orca capture permits have been issued since 1989. ** We are seeking to document encounters that were spontaneous or voluntary on the part of the cetaceans, representing their natural behaviors rather than commercial "swim with dolphin" or "dolphin encounter" experiences. Serendipitous, wild [legal] encounters from any era would be welcome. 10/27/14 - Forum Post: The Future of Captive Cetaceans? 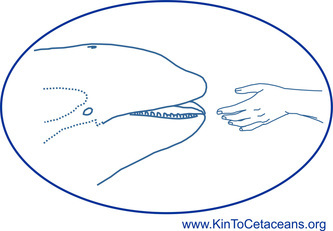 7/4/14 - Forum Post: Cetacean Non-Aggression, Biology or Culture?